Controversial bloggers, Oyemykke and Tunde Ednut may be bringing up new drama soon and it will definitely be a good watch. The gist is that a vidoe of Oyemykke has been making rounds on the internet. 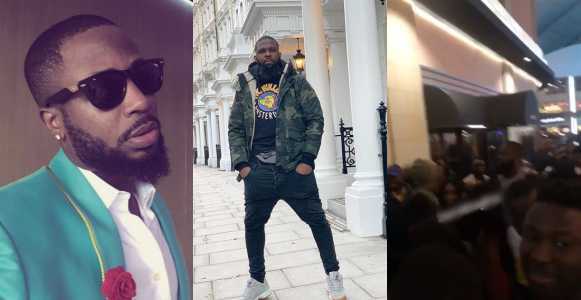 The video shows the moment when the social media commentator was bounced from singer, Wande Coal’s show in London. This, however, is coming after he made mockery of DJ Cuppy. In his usual manner, he made a video of the DJ, asking her to give up music. How Oyemyyke was bounced from Wande Coal’s show. According to reports which made rounds on social media, Oyemykke tried to gatecrash at the show as he did not have a ticket. Oye didn’t find the blogger’s comments funny so he promised to mess him up. According to him, Tunde knows the truth as he has access to inside information but he chose to go with the lies making rounds. Oyemykke says he will unleash his d**k on Tunde Ednut. TUNDE EDNUT WANDE COAL THEM BOUNCE AM COMOT!!! Some people only have levels only on Social Media. You dare insult Cuppy and think Cuppy no get level everywhere? AHHH TUNDE EDNUT AND I TRIED MY BEST NOT TO TALK ABOUT YOU ANYMORE BECAUSE A MAN I TRULY LOVE SAID I SHOULDNT BUT YOU SAID THIS ABOUT ME EVENTHOUGH YOU HAD THE MEANS OF TELLING THE TRUTH?? YOU KNOW TUNDE PHOENIX , HE KNOWS THE WHOLE STORY BUT BECAUSE YOU SO HATE ME YOU COULDNT TRY TO VERIFY A FAKE STORY ESPECIALLY WHEN YOU SPEAK THE THE GUY EVERY DAY?? THANK GOD FOR YOU MY BROTHER BECAUSE NOW IS THE TIME TO UNLEASH MY D-K ON YOU G.